You have drawn drawn the lady as your daily Lenormand Tarot card for today. 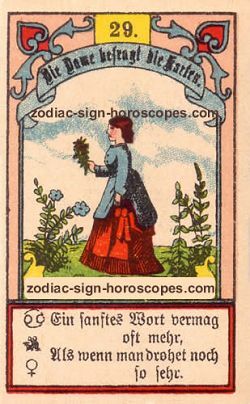 The lady is a neutral card, so the day today will also have a neutral tendency. It is the planet Venus which will influence you today. This day will bring you disputes. warning: Do not keep yourself for too seriously and do not become the focus of attention too much. This card has as a single card almost no meanings. Based on the location of this card you can draw conclusions about how the male main character currently manage his life. At the topof the spread he has everything under control, at below everything overruns him. Is he on the edge of a spread and looks out of the spread, he has a very exciting time behind him. If he looks into the spread, he has finished with the past and now looks into the future. The average rating result is 8.13 of 10 stars.